Would you believe me if I said it's possible to make beautiful Christmas ornaments, gifts, and decor without spending a lot of time? 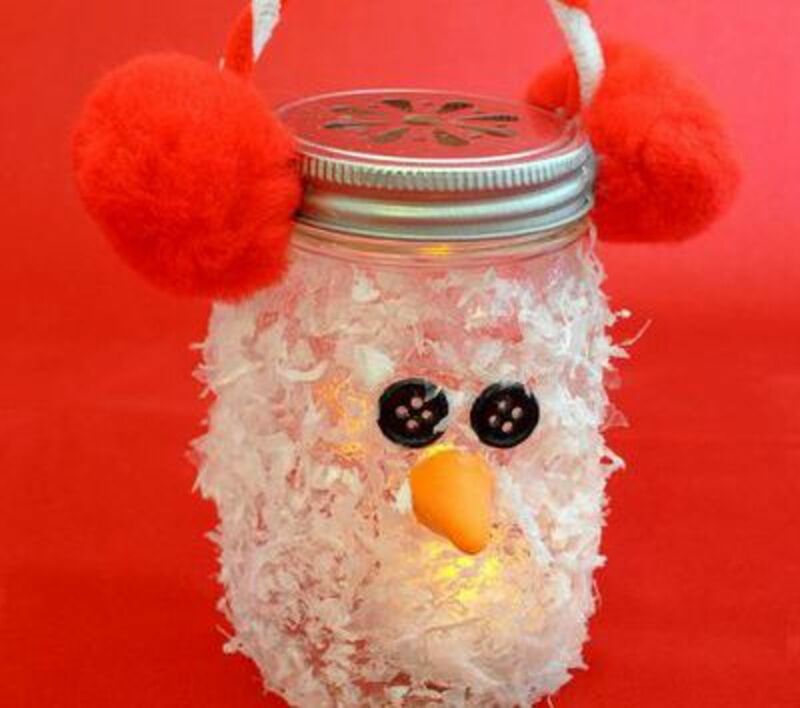 For this article, I researched Christmas crafts that take 30 minutes or less to create. These projects require common and easy-to-find supplies that are inexpensive to buy. Who knew!? 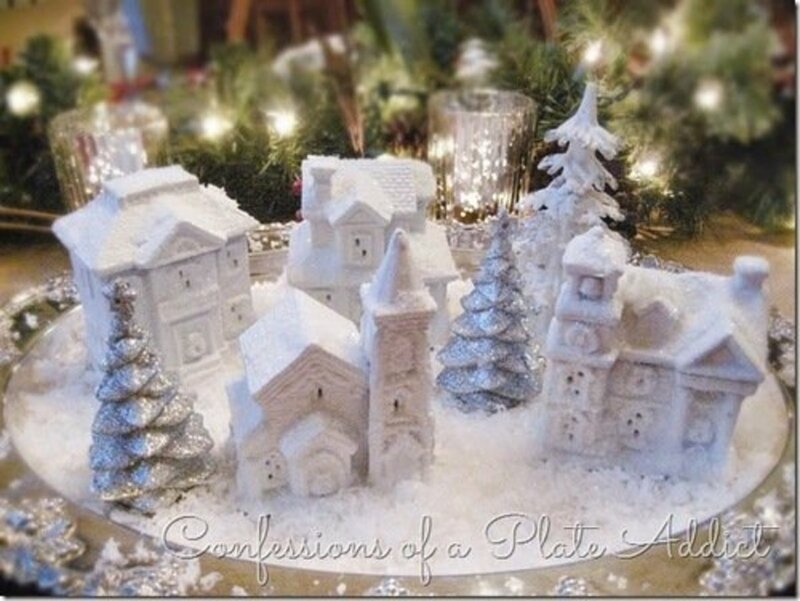 To transform dollar store village houses into a beautiful, snowy Christmas village (shown above), visit Confessions of a Plate Addict for the tutorial. 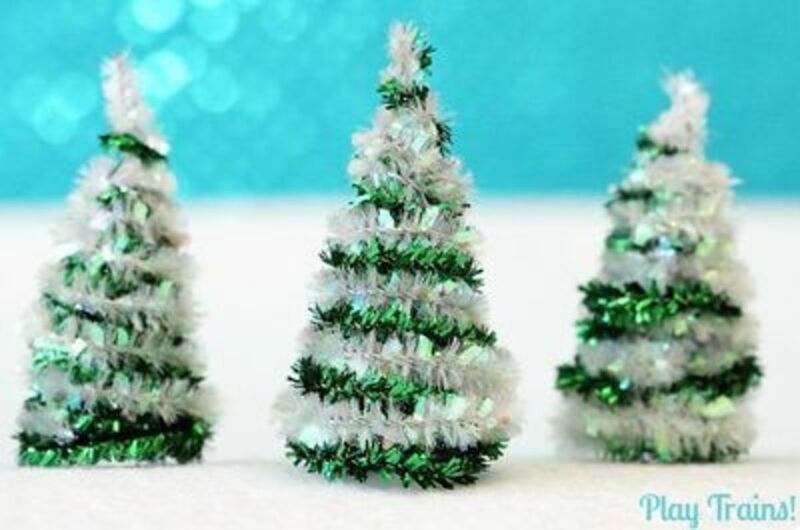 The tutorial at Play Trains explains how to make these cute pipe cleaner trees. 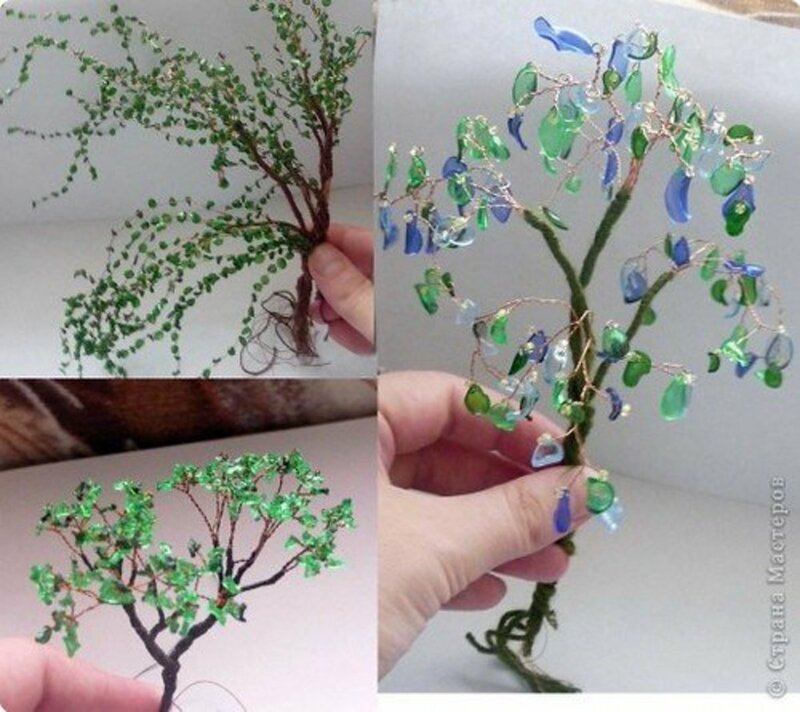 On the website, you'll also find trees made with different pipe cleaner colors. The white trees are especially beautiful, and would make a great addition to a miniature Christmas village. 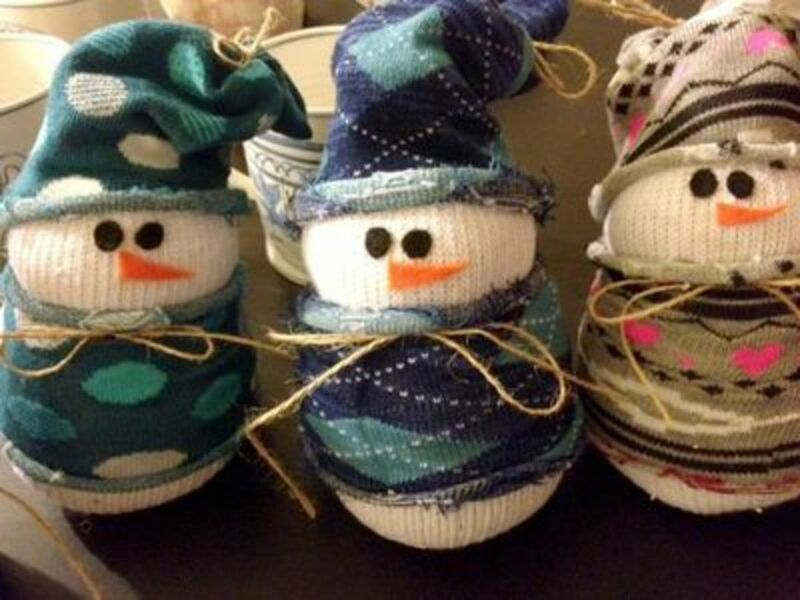 This is a great Christmas project to make using socks who have lost their match. 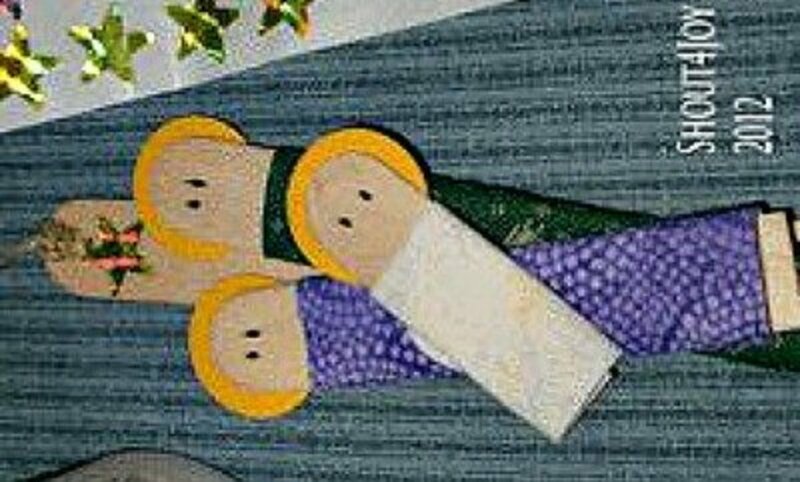 Patterned socks make for the most beautiful snowmen. You can find this tutorial at Ciao Mama. 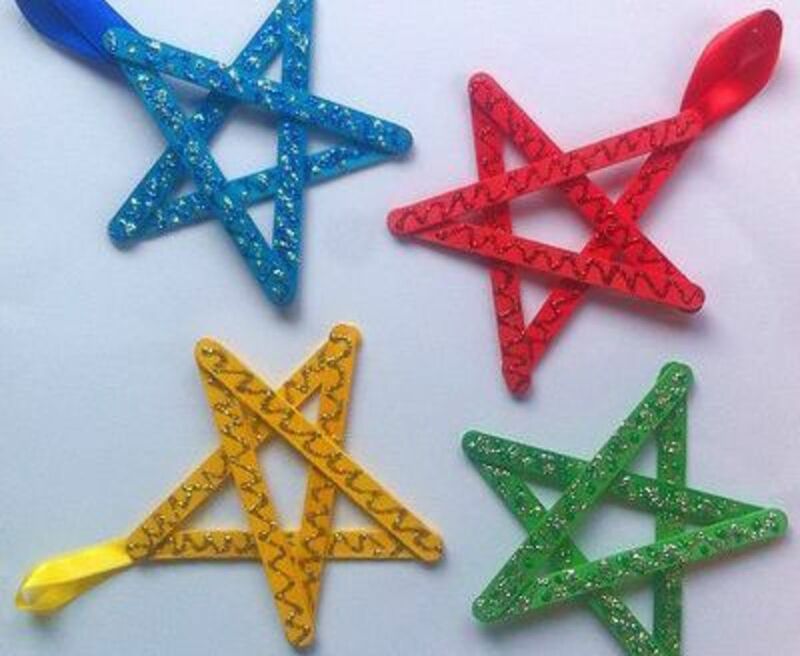 I've made a number of these 3D stars using the patterns and directions found at Vivid Ideas. They have all turned out perfectly. I've also used old Christmas cards and old calendar pictures to make these stars–a July calendar page made some especially beautiful patriotic stars, which I fun-tacked to my office wall. 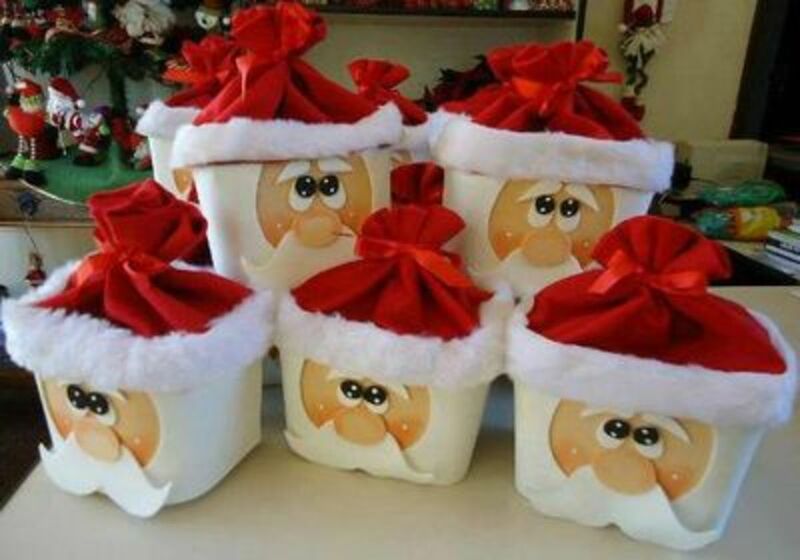 Imagine all the ways you could use these Santa containers, which are made using empty ice cream boxes. One idea is to use them to give homemade cookies or candies as gifts. These are also cute when used in a table centerpiece. Find the directions at Praktic Ideas. 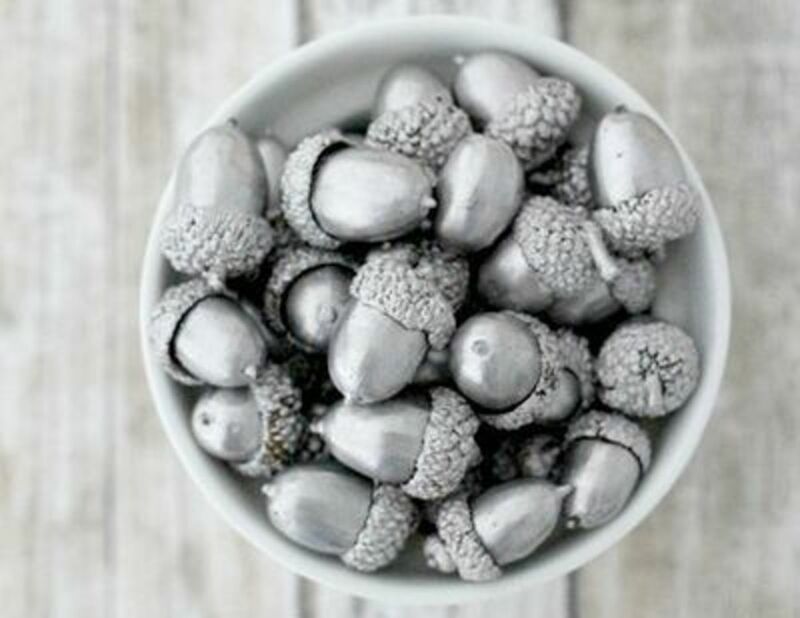 Liquid silver leaf makes it simple to make gorgeous acorns to use as holiday decor. You'll find the tutorial for preparing and painting these acorns at Lovely Etc. This is an easy project that requires very inexpensive supplies. It is a great craft to make, especially if you need a bunch of party decorations fast. Find the instructions for making this snowman at Chica Circle. 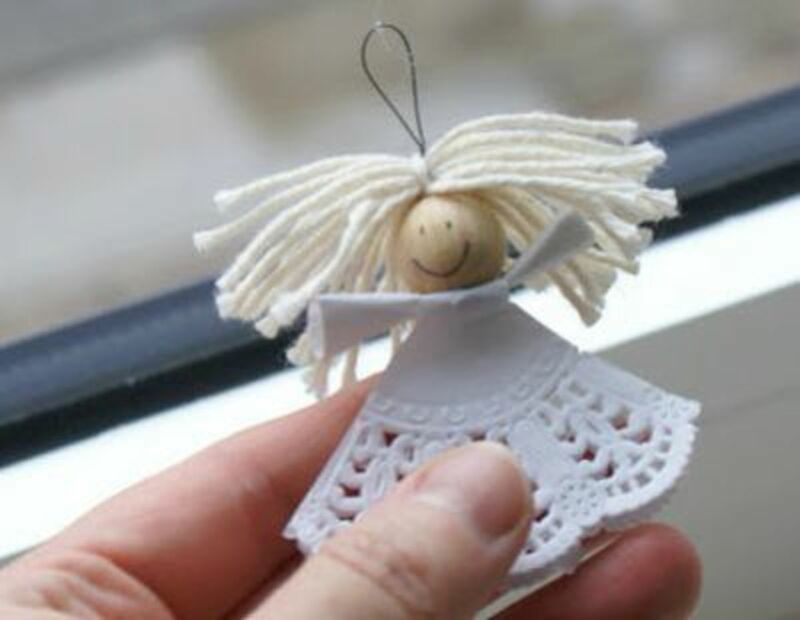 Making these cute doily angels is easy. 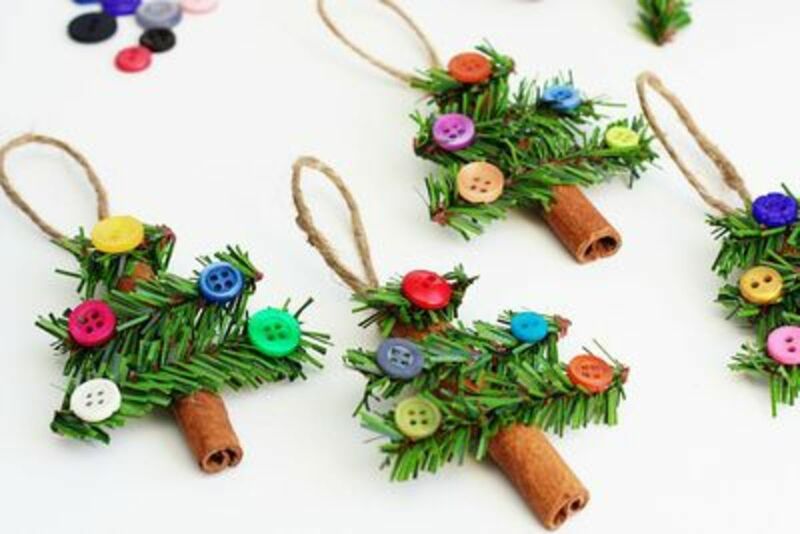 Simply attach them to a ribbon to make a garland, or hang them individually to make tree ornaments. You'll find the tutorial for these at the ArtMind website. 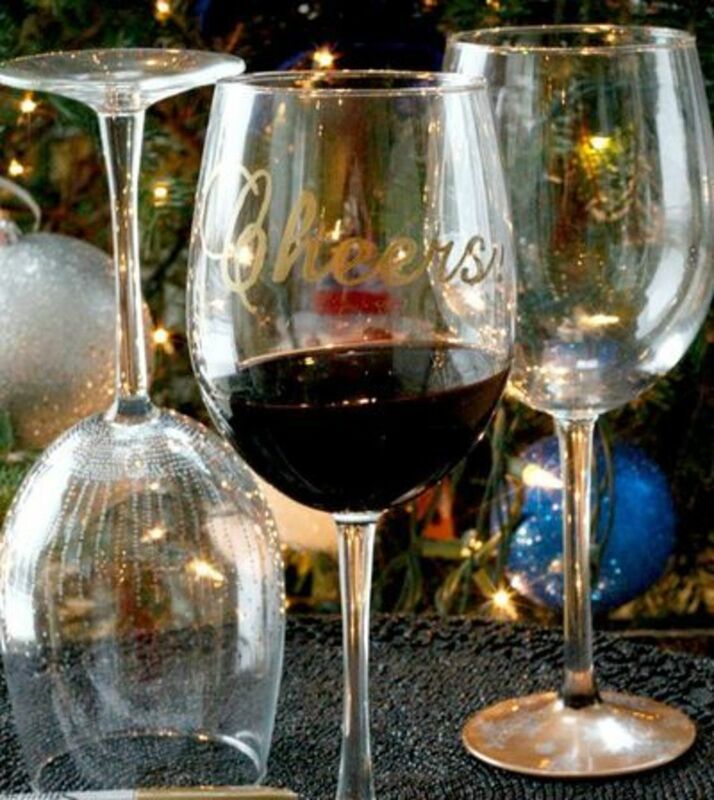 By following the tutorial at Belle Vie, you'll be able to make beautiful, custom wine glasses to give away as gifts or use on your holiday table. Gold and/or silver Sharpies are the key supplies for this simple project. 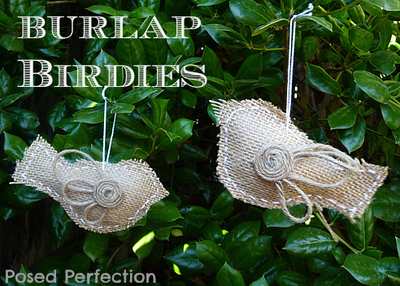 I love these little burlap bird ornaments. You can either draw a bird shape or type "bird silhouette clip art" into Google to get a template. Go to Posed Perfection and follow the step-by-step tutorial. It's so easy! 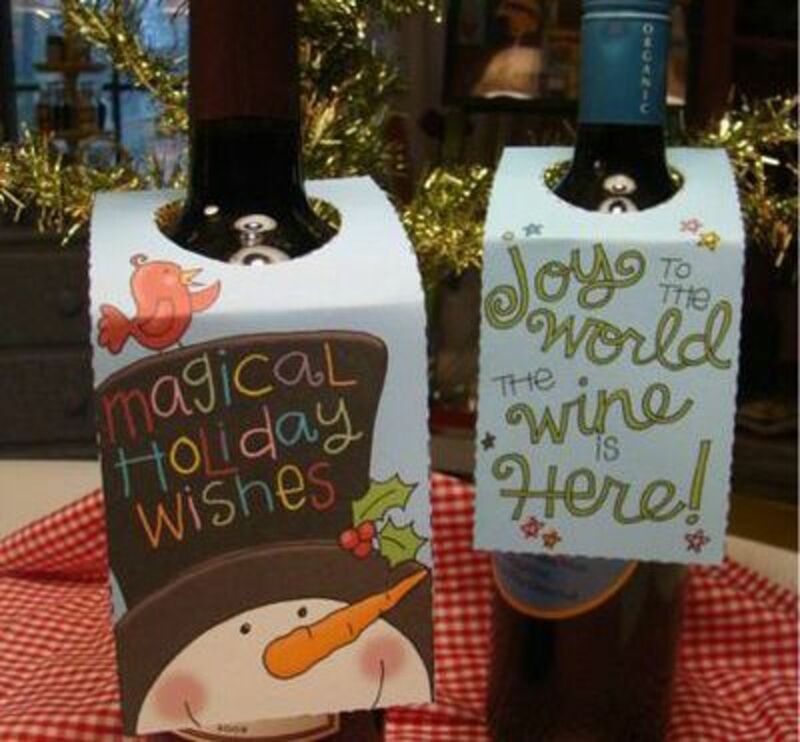 When you visit the Fresh Picked Whimsy site, you'll find free templates for these holiday bottle toppers. This is great website that you'll want to bookmark. I've often thought about making a gingerbread village, but I really didn't want to spend much time on something that couldn't be used again. 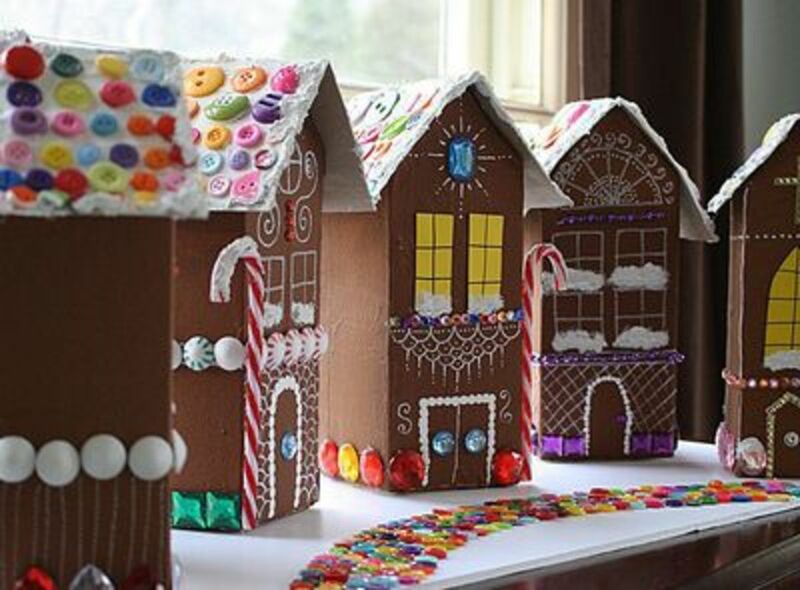 This gingerbread house project by Crafts by Amanda, which uses recycled milk cartons, is a great alternative. 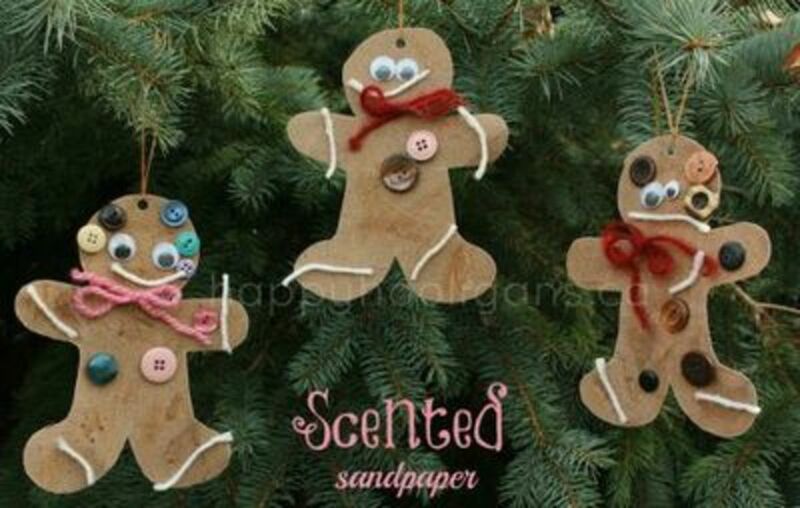 If you want to include the kids when making Christmas ornaments and decorations, you'll love this project. The instructions can be found at Speech Room Style. 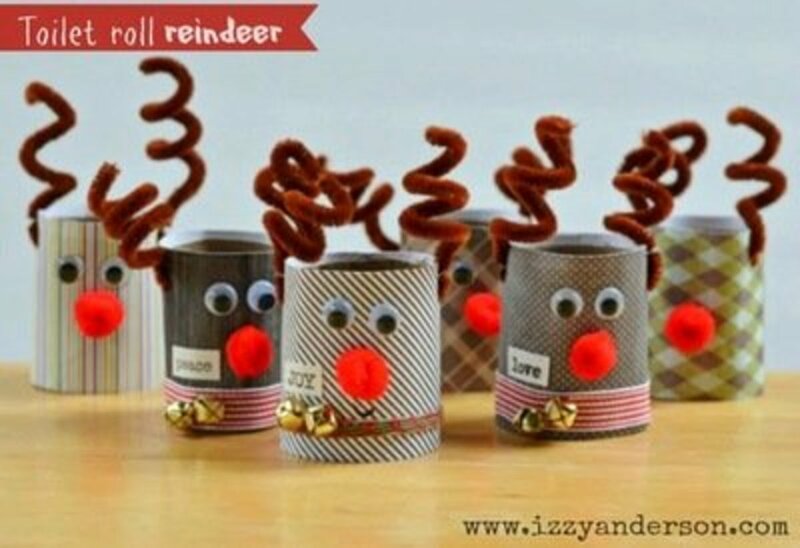 With so many pretty scrap book paper options to choose from, you'll want to make lots of these toilet paper roll reindeer. If you don't want to buy scrap book paper, design your own prints on blank paper with paint or colored markers. Find the instructions for making these at Izzy Anderson. The directions explaining how to make this stained glass project can be found at Housing a Forest. 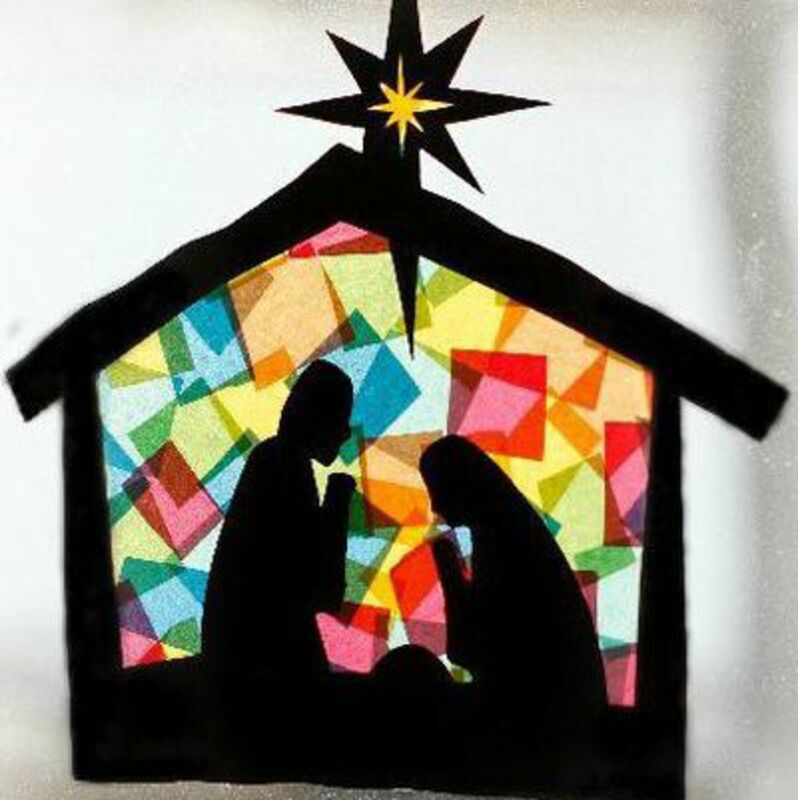 Find a simple Nativity silhouette pattern by entering "nativity silhouette clip art" into Google. Then, copy and paste the image and use it for your pattern. Not only are these little cinnamon stick trees cute as can be, they smell terrific. 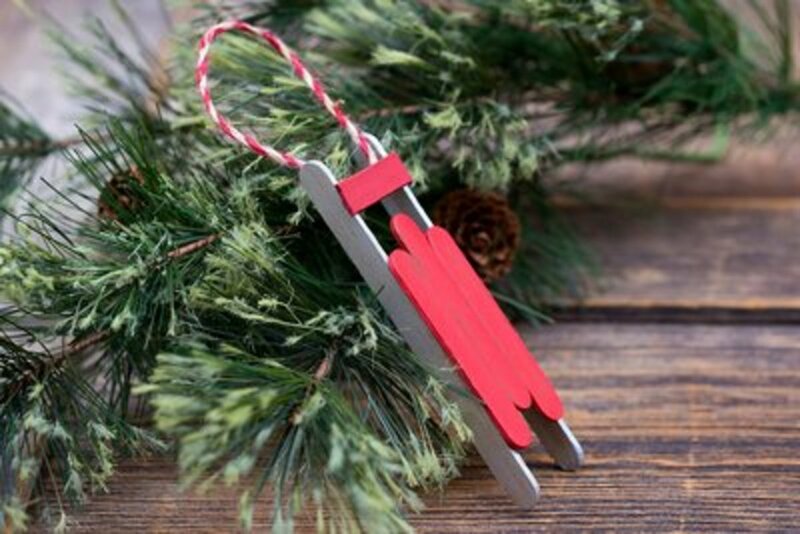 Add a pin to the back of them to make Christmas pins, or add a ribbon loop and use them as ornaments. You could even glue them to a skewer or wire and add them to a centerpiece. 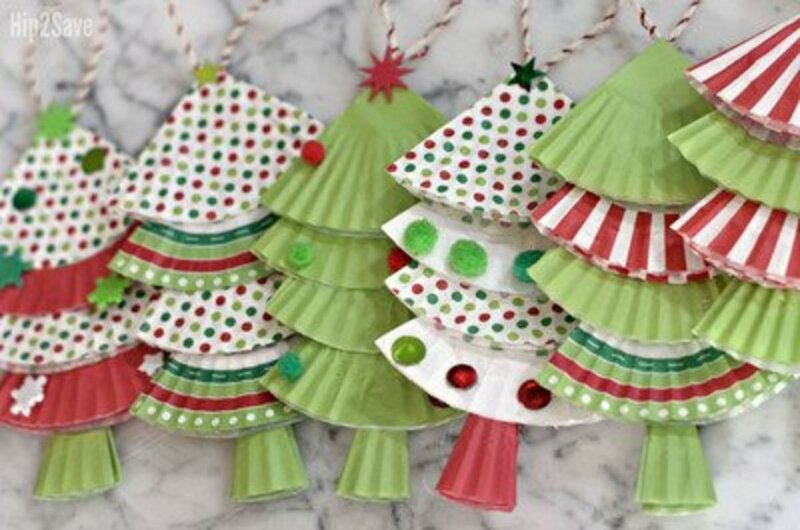 Find a tutorial for making these attractive trees at Crafts Unleashed. Simple instructions explaining how to make these fun crafts can be found at Happy Hooligans. Make lasting memories while crafting as a family. 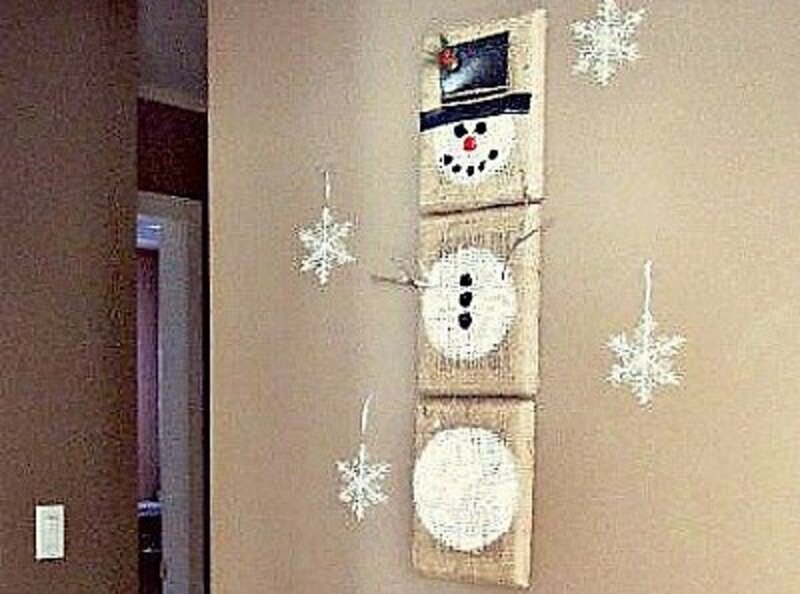 Visit the Better Homes & Gardens page for the snowman garland tutorial. Make sure to click on "more" to see all the instructions. 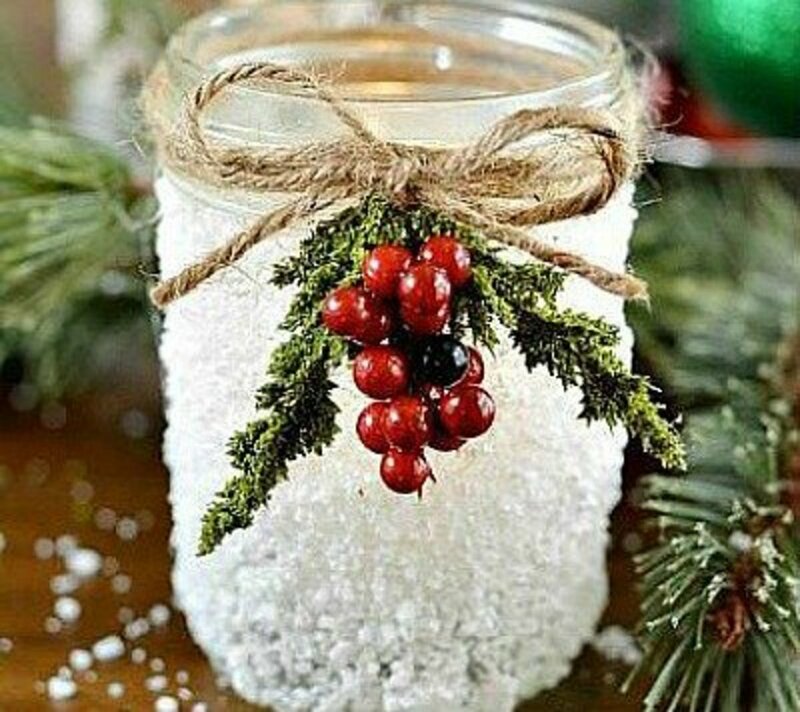 It's amazing how easy it is to make beautiful Christmas decorations using simple supplies like glass jars and Epsom salts. 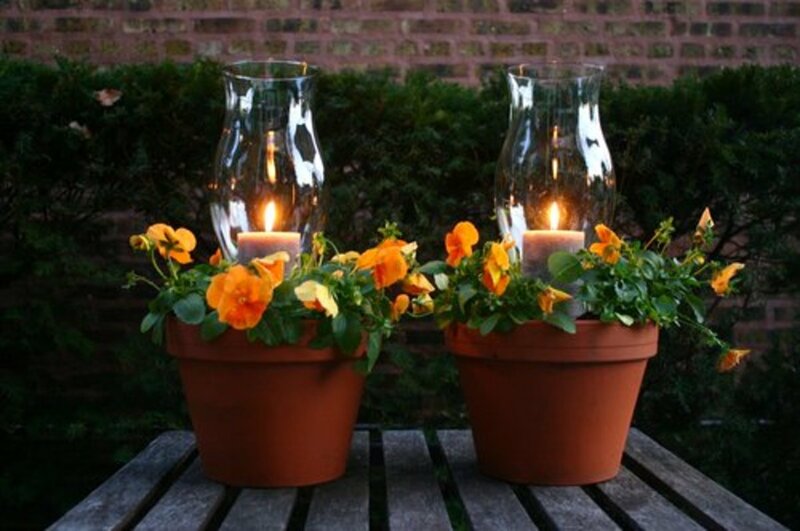 Make a group of these with a bit of greenery and you'll be left with an attractive centerpiece. The directions can be found at DecoArt blog. 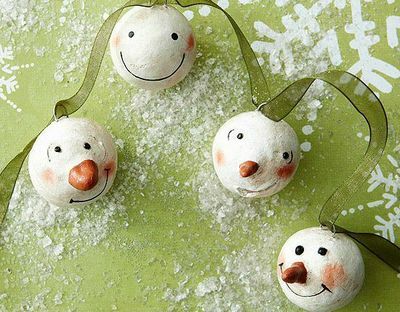 Use fat craft sticks to make great snowman ornaments. Decorating them with paint, buttons, and ribbons is a fun activity for all. Find the instructions at How to Have It All. 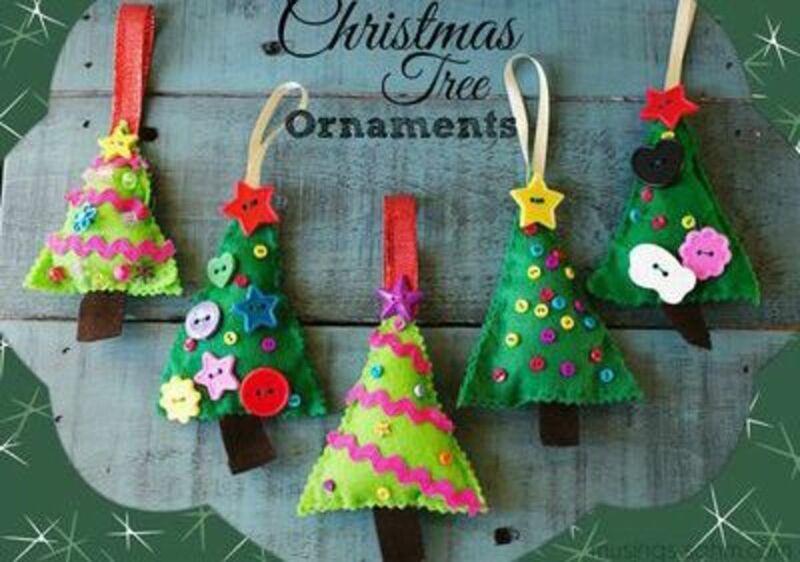 This Christmas tree craft is so cute you might even want to frame it in a glass frame to keep forever. Be sure to write the name of the artist and the date on the back of the art, so you'll remember the age and the identity of the artist at the time the craft was made. 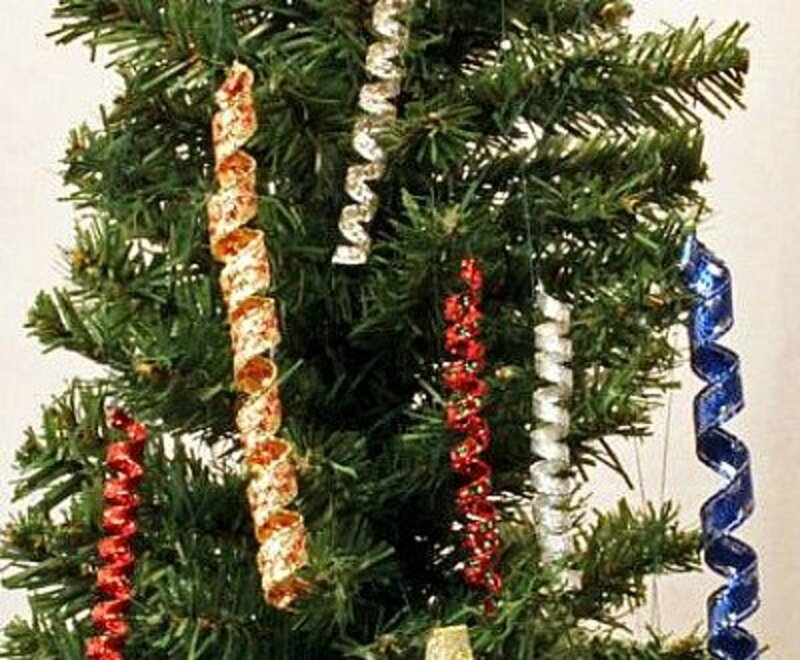 This is such an easy craft, offering so many opportunities to make the tree unique. Go to Let Their Light Shine! for directions. 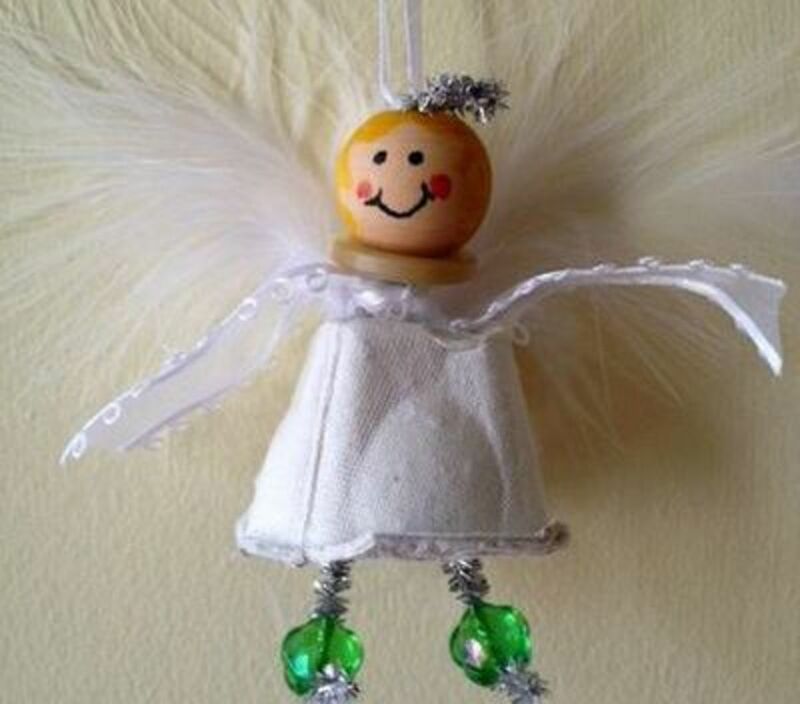 This little angel project proves very cute ornaments can be made using simple recyclable items, such as an egg carton. What a transformation when you add a bit of paint, a cute little bead face, and feather wings! 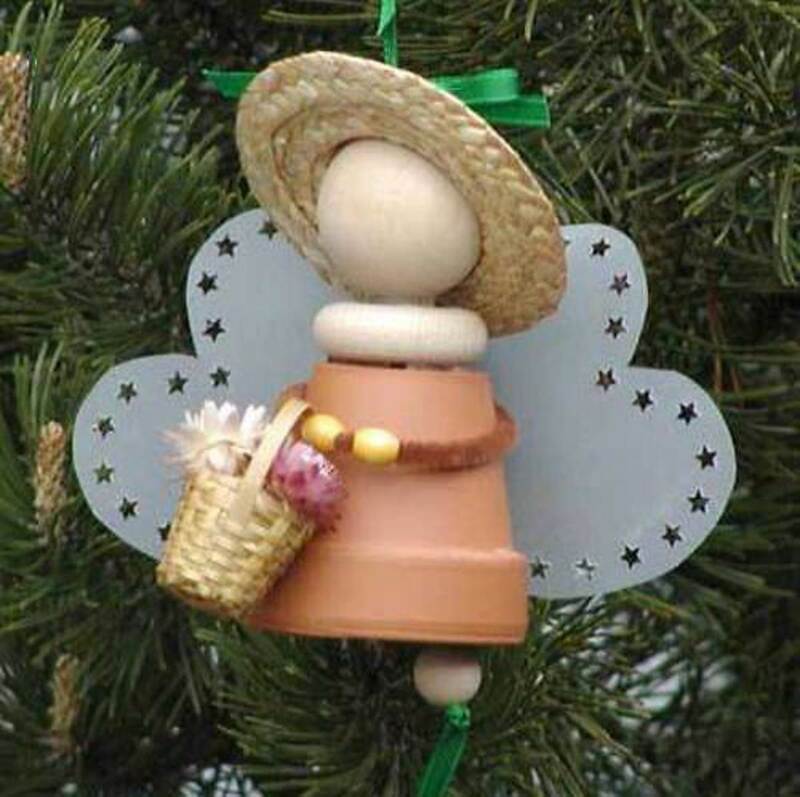 Learn how this egg carton cup angel is made by going to the Meaningful Mama website for instructions. 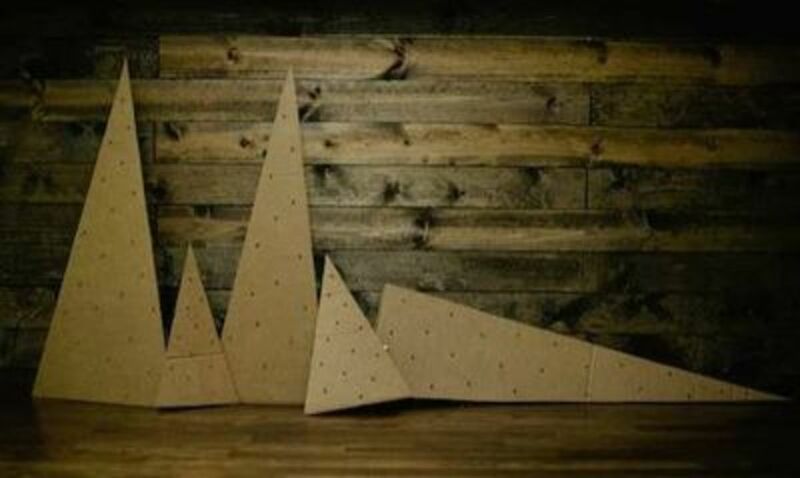 Visit the Trendhunter site to learn how to make these cardboard Christmas trees and see how they look when illuminated. This is an outstanding, easy, and inexpensive craft. Just imagine how good these would look on your Christmas mantel! Since they can be made any size you wish, you can put them anywhere. 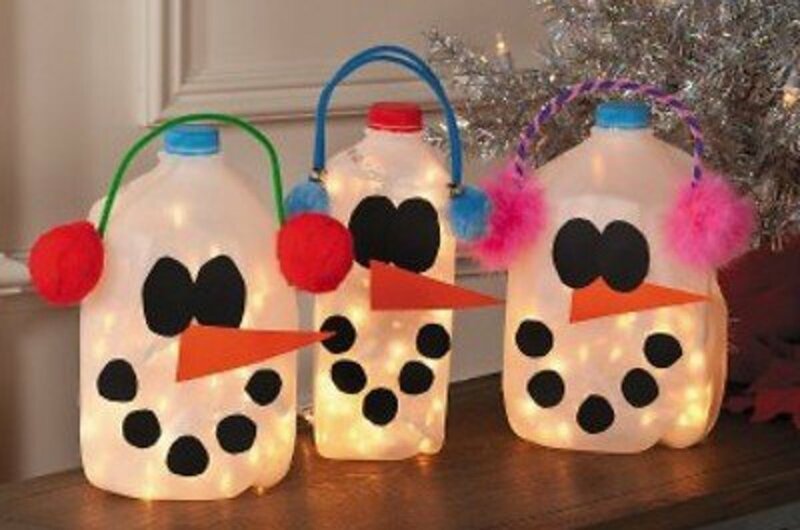 These glowing snowmen are the perfect thing to greet your holiday guests when they arrive at your front door. Find out how to make these at Free-N-Fun. If you need to decorate for a large gathering, consider making these cupcake liner Christmas trees. They can be made different sizes, depending on which cupcake liner you buy. Go to Hip 2 Save to find instructions for this project. 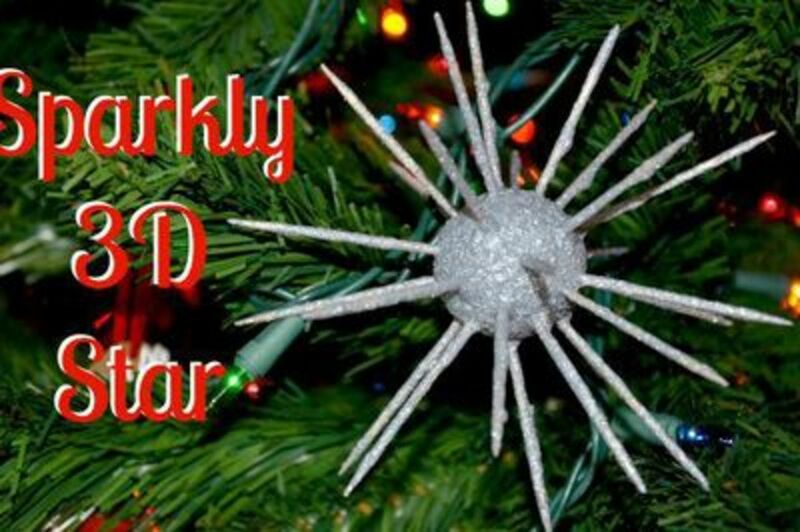 Although I think this silver star ornament is very pretty, I think I'd make mine white and add white glitter. Whatever color you decide, they are beautiful and will add elegance to your decor. 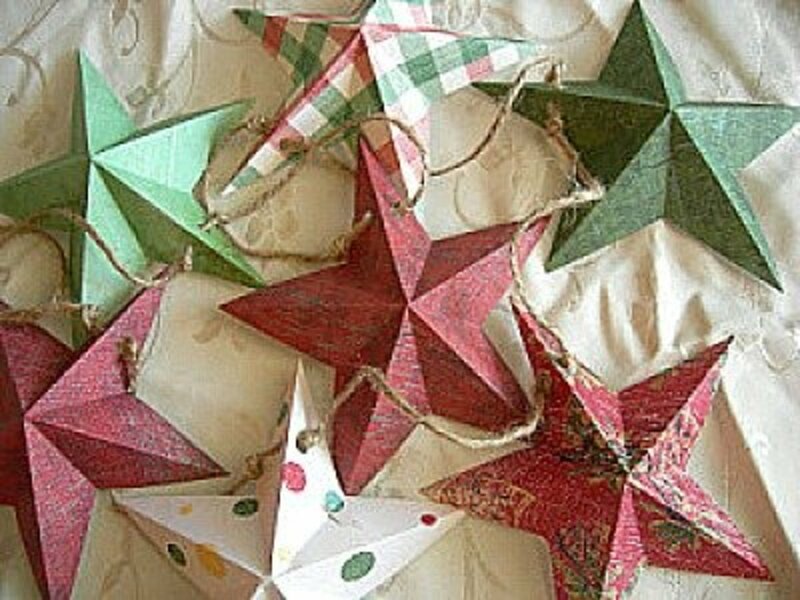 Find the tutorial for making these stars at Raising the Cameron Clan. 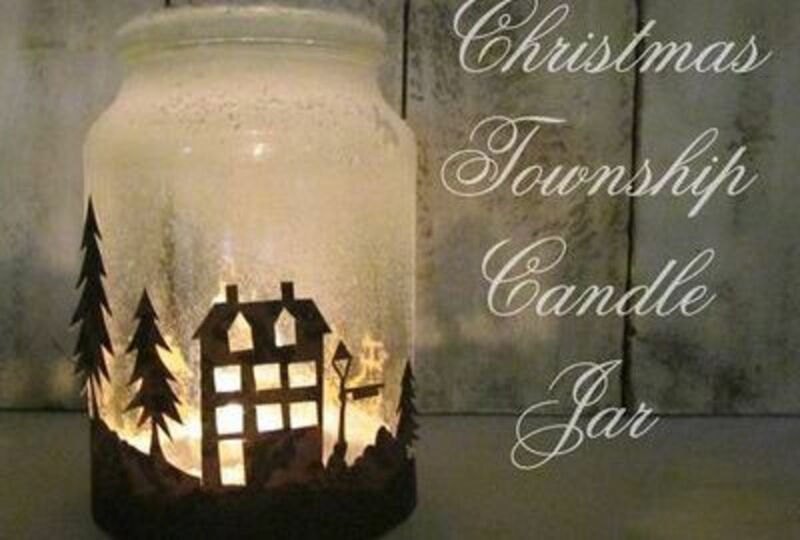 Directly under the picture at Shabby Art Boutique, there is a template and instruction sheet to make this candle jar. Make sure to click the link. Popsicle sticks, paint, and colored glitter glue sticks are the supplies you will need for this craft, which are all available at any craft or dollar store. 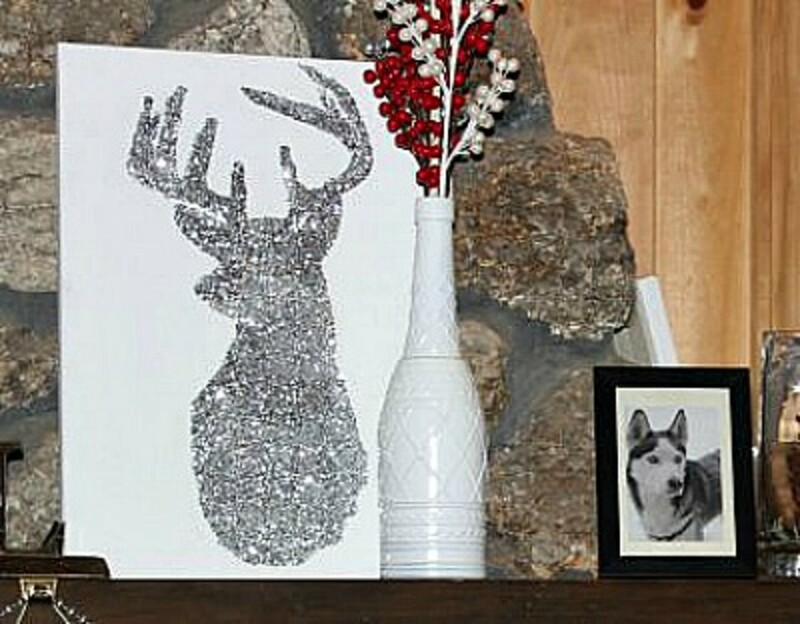 The glitter glue takes a while to dry, so make sure to designate a space for this project. Visit Powerful Mothering for the instructions. 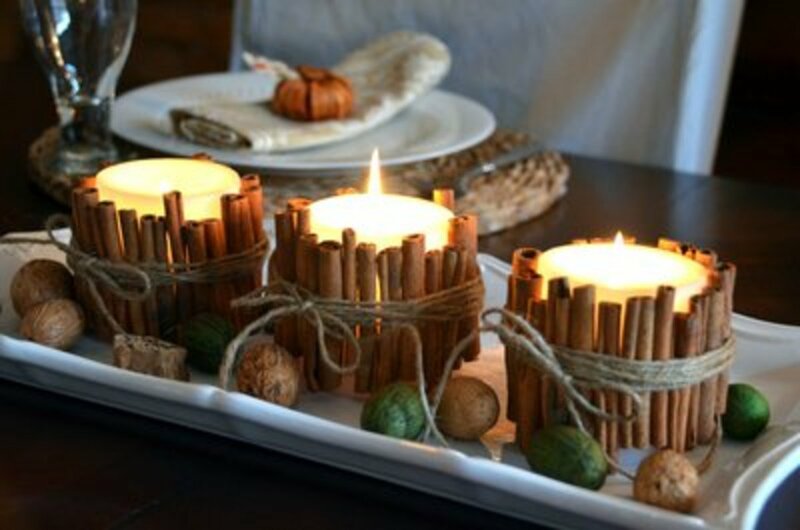 These cinnamon stick candles aren't for Christmas only, but they are a perfect craft for the holidays. The scent of cinnamon always reminds me of the wintertime. Go to the Home Stories website to find the tutorial describing how to make these. 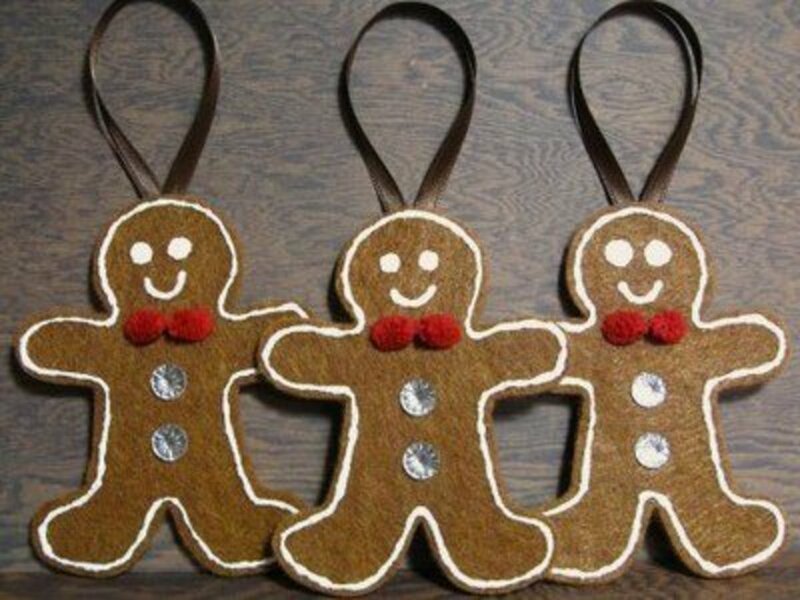 Using white puff paint to decorate felt gingerbread man ornaments makes for a super easy Christmas craft project. 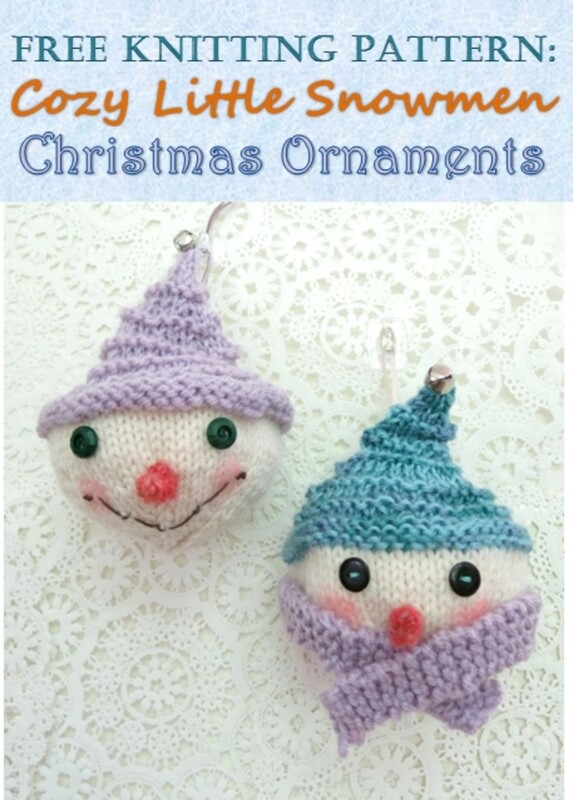 Find all the directions for these ornaments at Created by Jess. 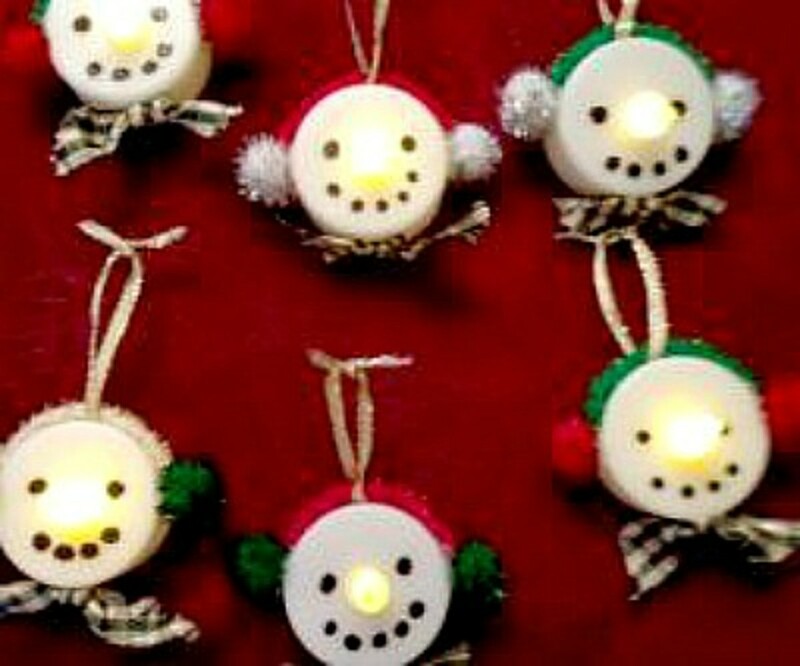 If you need some cute party favors to give your guests during the holidays, consider making these tea light snowmen. You can find the instructions for this project at Celebration Ideas Online! 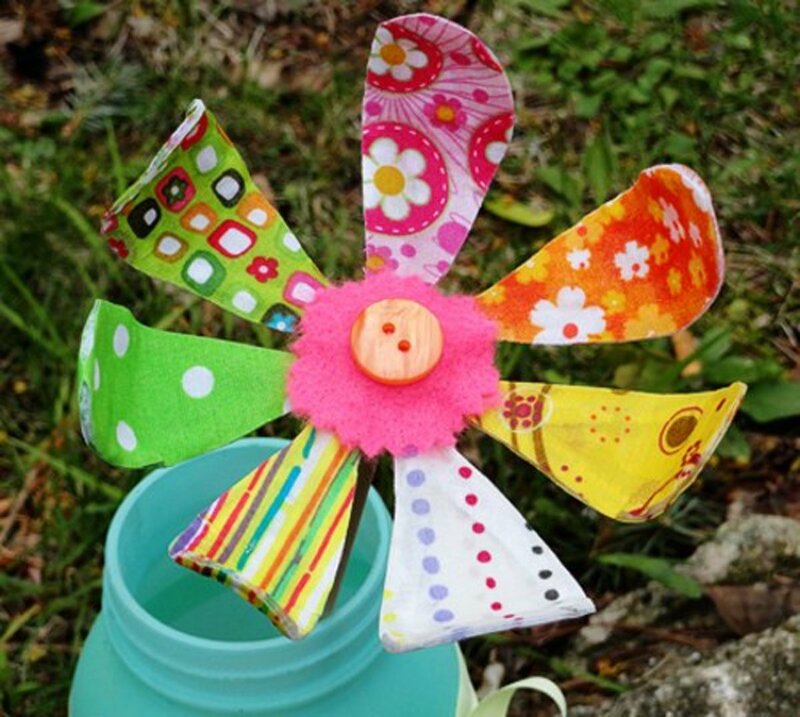 Not only is this a craft the kids can make, it is also a great idea for senior crafters. Making a Nativity ornament reminds us why we celebrate Christmas. Find the tutorial at Am I Shouting Yet? 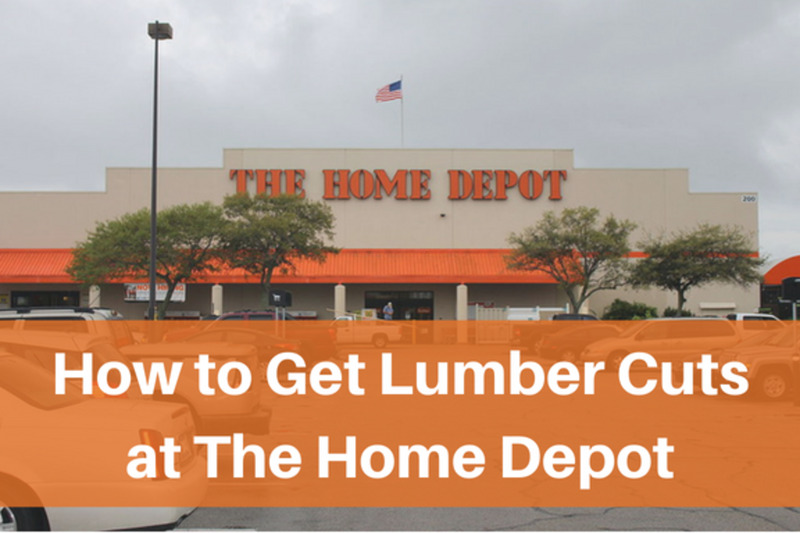 This may seem like a project that takes more than 30 minutes, but it isn't. 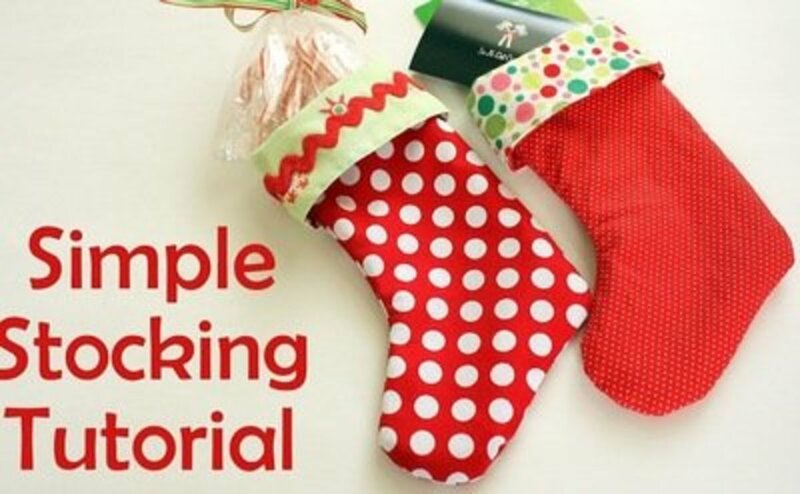 Be sure to read through the directions at U Create a couple of times before starting this stocking. 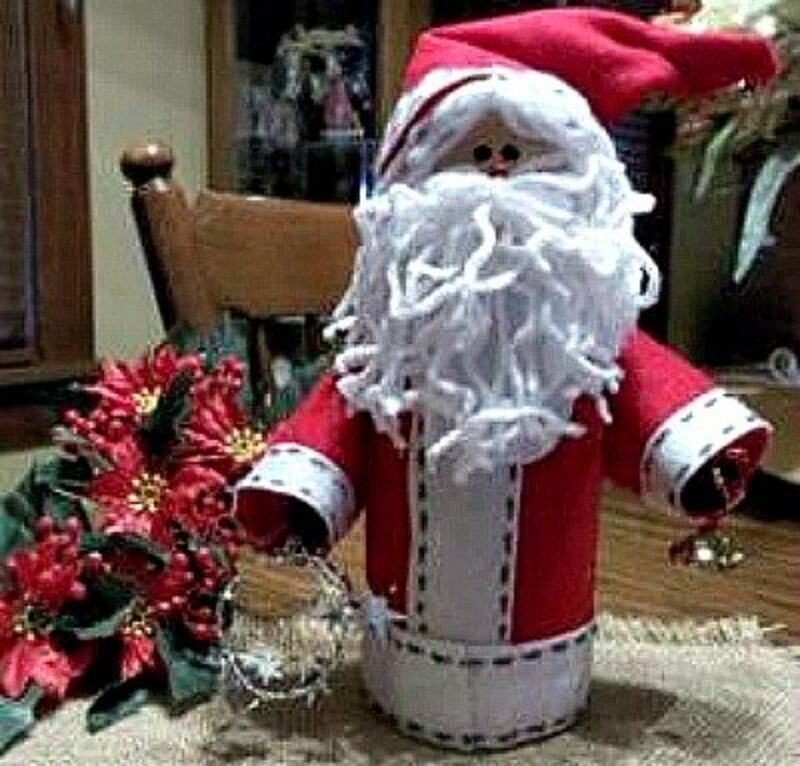 Find patterns for making this bottle Santa at Santa Craft From Creamer Bottle. 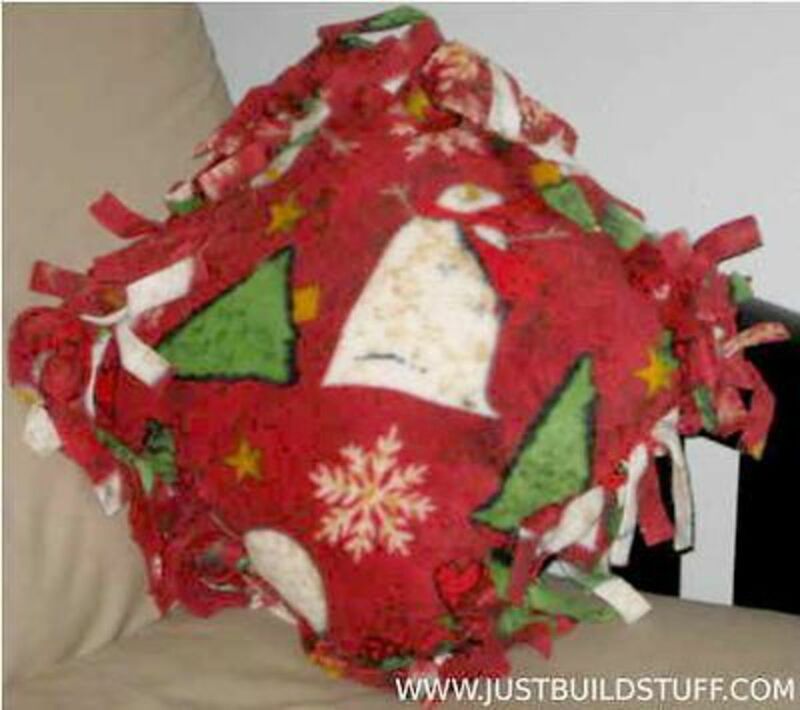 Polar fleece is a great fabric to use to make quick and easy pillows. Just cut slits along the edges of the fleece, then tie. With so many seasonal fleece prints, you can give everyone on your list a pillow for Christmas. See how easy this pillow is to make by going to Just Build Stuff for the directions. 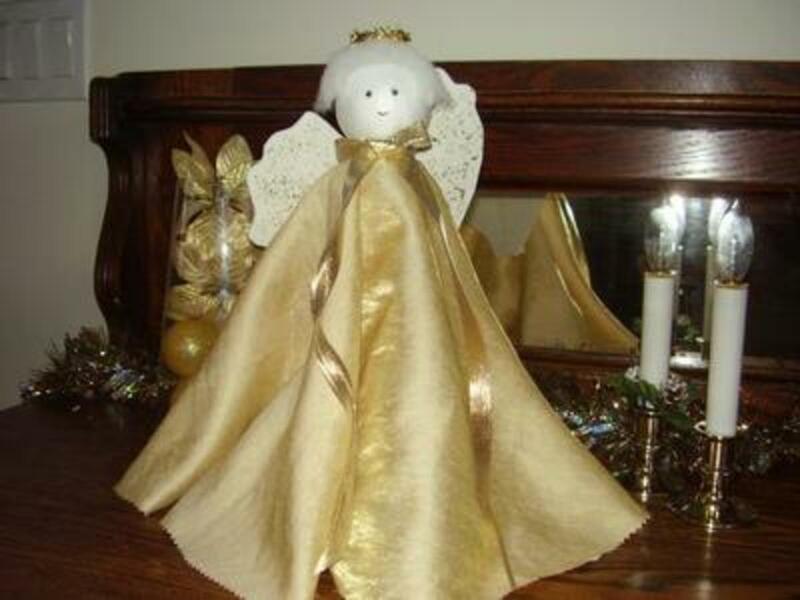 This beautiful Christmas angel could be easily made into a tree topper by cutting the bottom off of the soap bottle. Can you imagine how proud you and your kids will be when you tell folks that you made the angel yourselves? 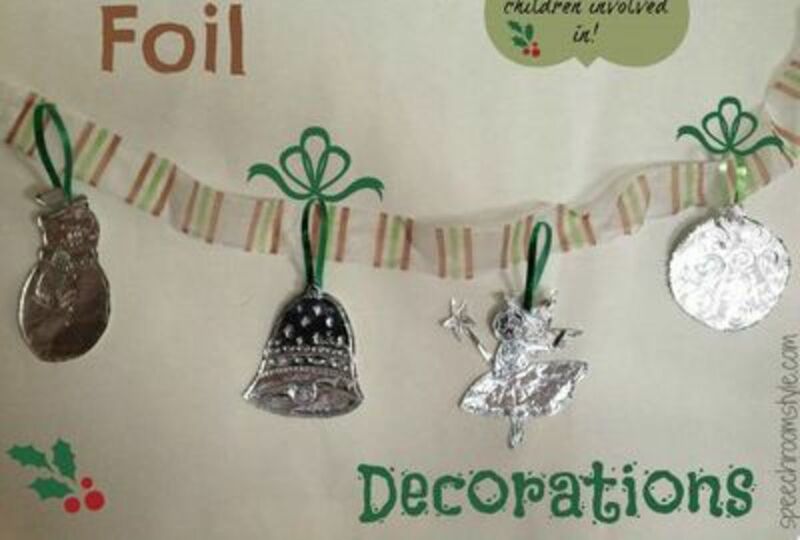 Go to Preschool Toolkit for the instructions on how to make this Christmas angel. 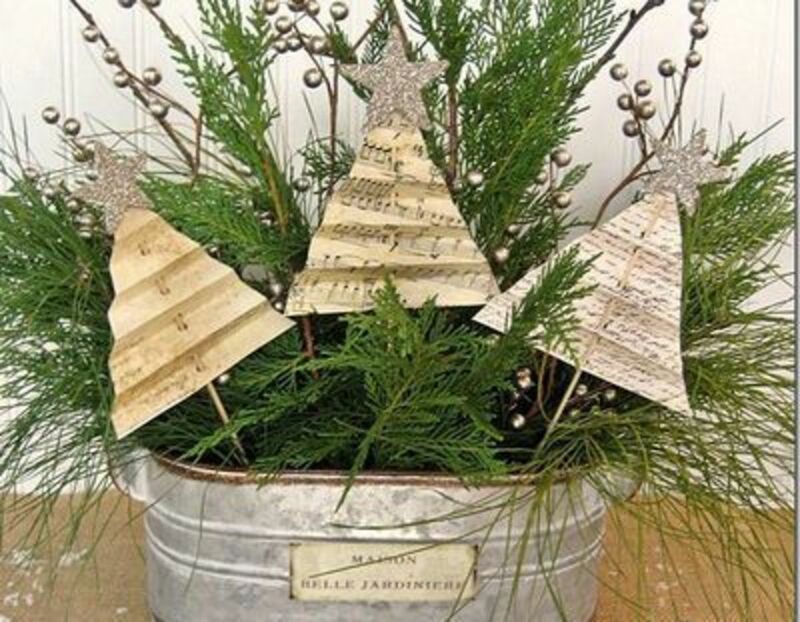 I don't think you'll find an easier Christmas tree craft than this one, which you can use to dress your holiday greenery. Find the instructions at Confessions of a Plate Addict. Here is another quick holiday art project that will require you to use Google. Search for a reindeer pattern, and you should find a nice assortment of silhouettes to choose from. The rest will be explained at Freshwater Studio. Aren't these pretty? They are easy to make, too. The tutorial for this project can be found at funEZcrafts. 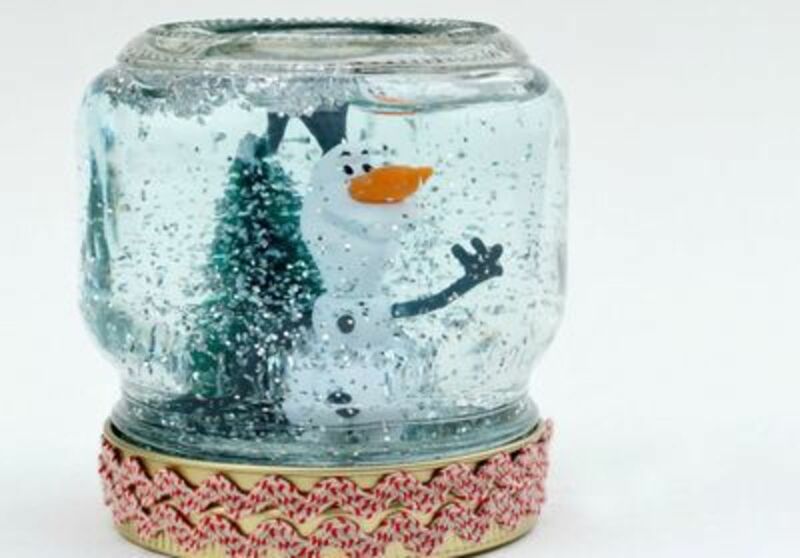 Go to a dollar or craft store to find figurines to use in your snow globe. This little Olaf snowman is certainly a cutie. To make one of these, go to the Mollymoo website for a tutorial. 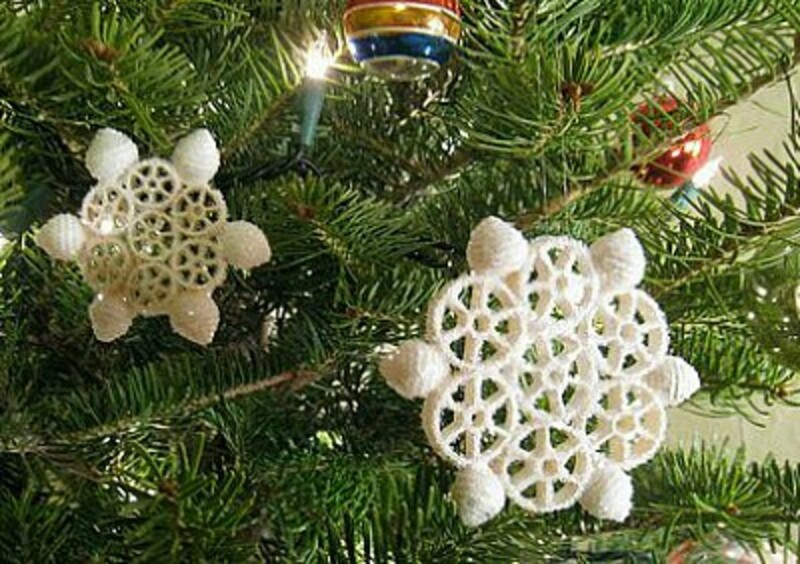 This would be a perfect way to revamp old Christmas ornaments you no longer want to display. 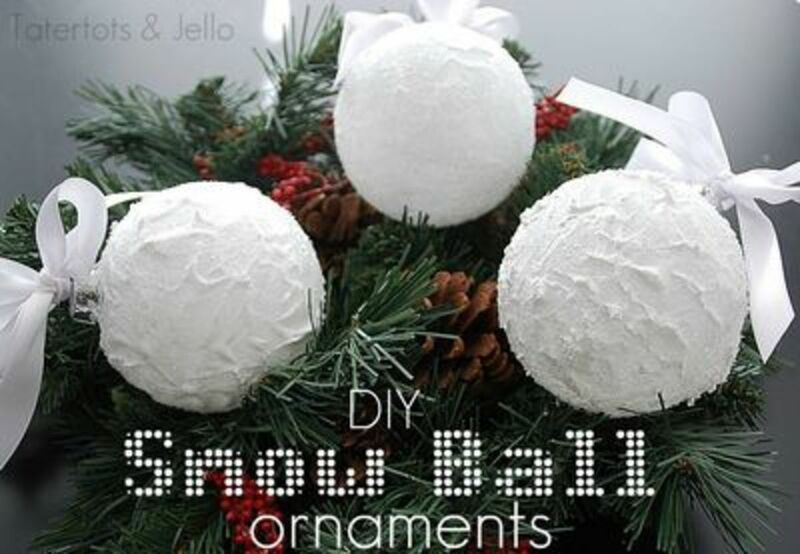 If the balls are colored, give them a couple of coats of white paint before adding the snow medium and glitter. You'll find the tutorial for these at The Scrap Shoppe. The only sewing needed for these is done by hand. Check out the instructions at Living Well Mom. It's easy to make a bunch of these little trees to give as gifts. 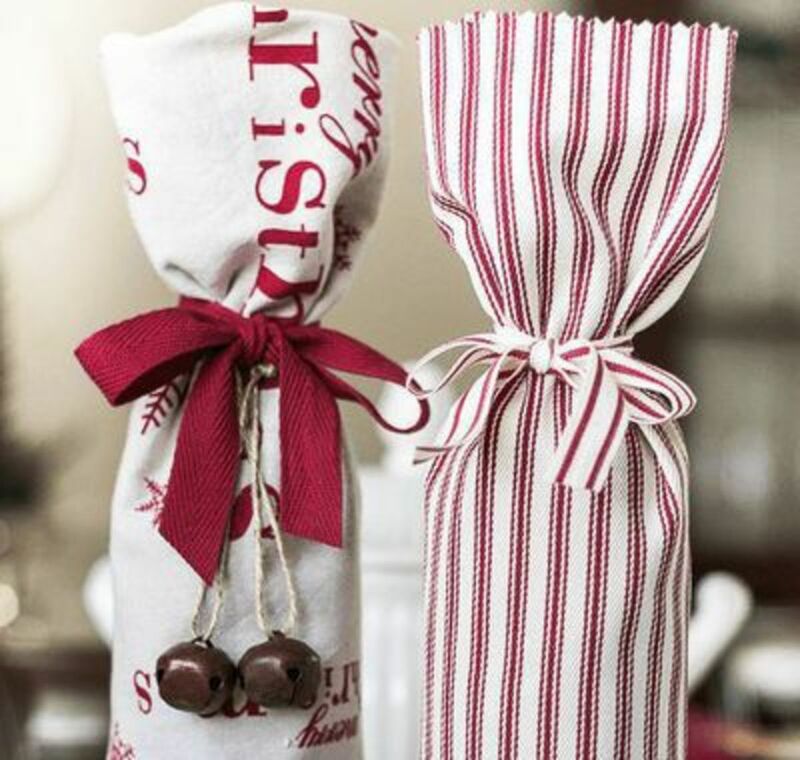 If you like to gift wine for Christmas, it always looks nice when the bottle is wrapped. This fabric bottle wrap is extremely easy to make, and there is no sewing involved. Check out the instructions at On Sutton Place. 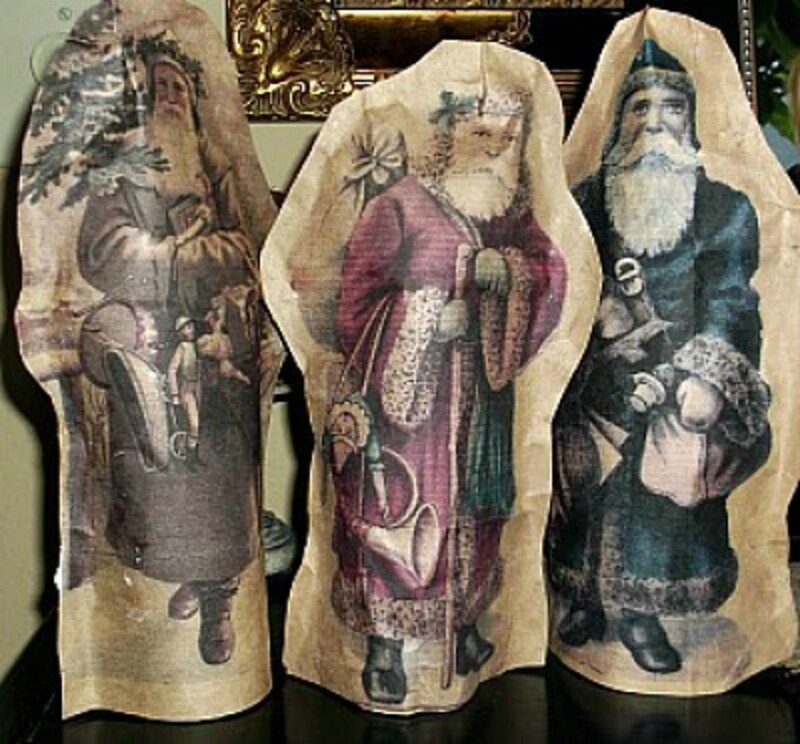 You'll love incorporating these vintage Santas into your Christmas decorations. The brown paper grocery bags give them a truly aged look. Find the instructions at Kids & Glitter. 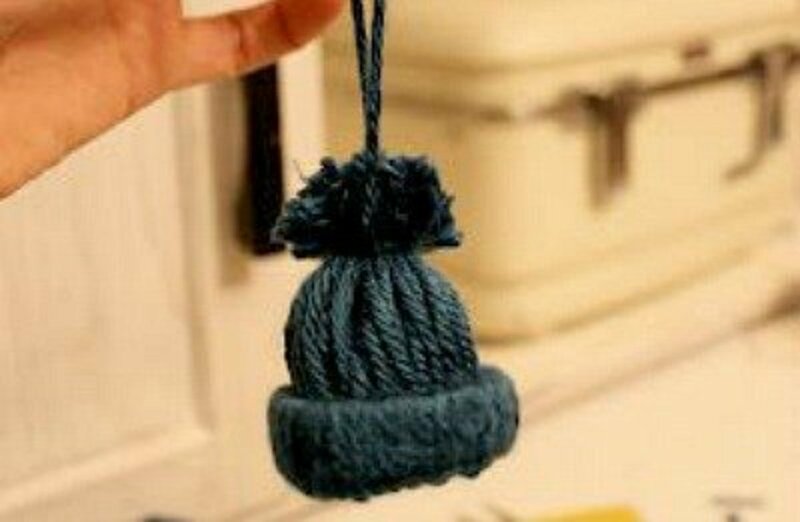 Whether you make this little stocking cap with one color of yarn or combine two or three, they all come out looking cute and perfect. The easy-to-understand directions can be found at Arian’s Studio. Crafts by Amanda are always super cute, but this one is super easy. 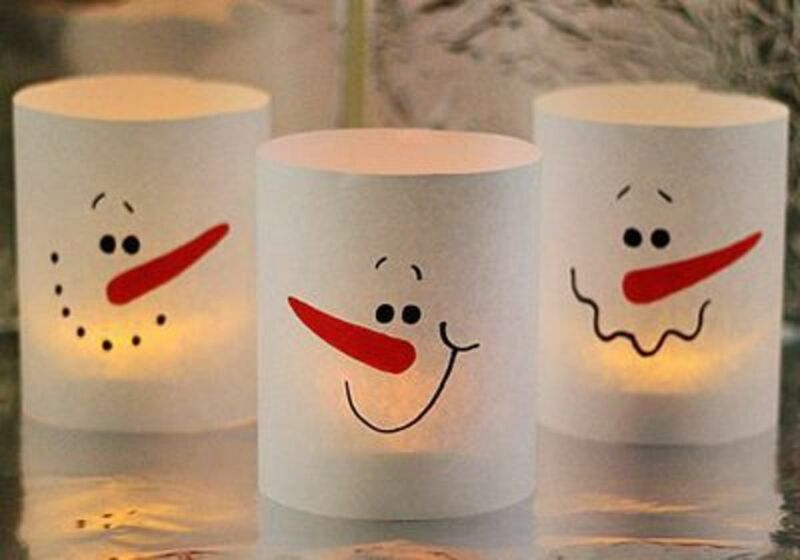 Add the flameless tea light and you have a top-notch craft. 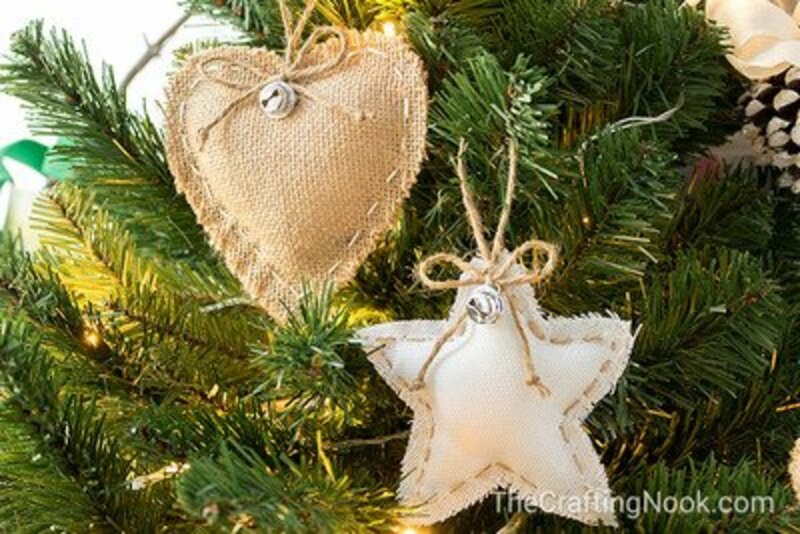 Find the directions explaining how to make these country Christmas ornaments at The Crafting Nook. This is a delightful way to use old picture frames. You can purchase inexpensive ones at the dollar or thrift store. Find the tutorial at How to... This & That. Have you ever noticed all the different shapes pasta comes in? It seems I'm always discovering new shapes, and that they would all make perfect tree ornaments. 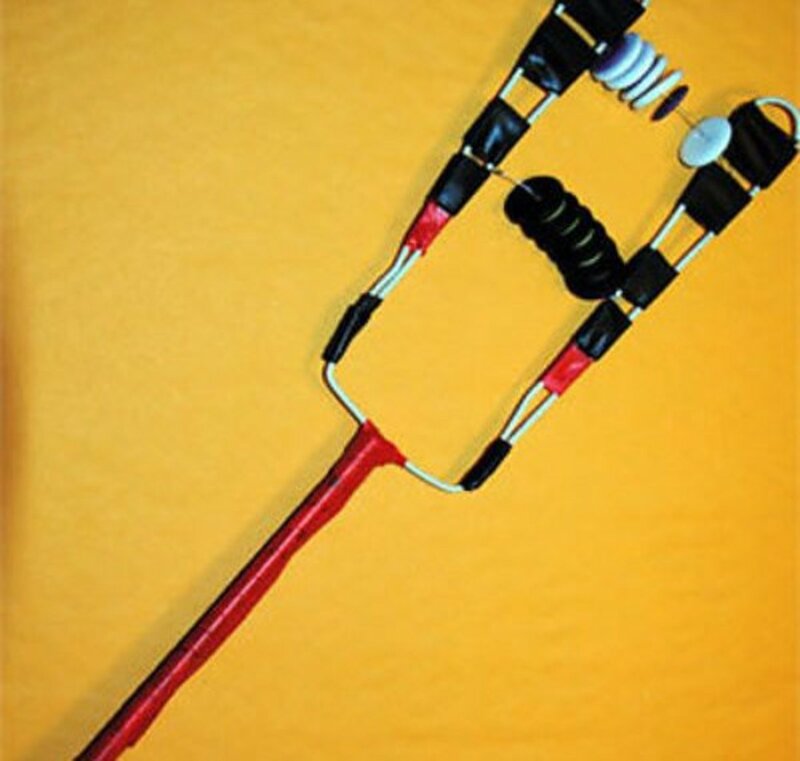 You'll find a variety of ideas and colors at DIY Enthusiasts. 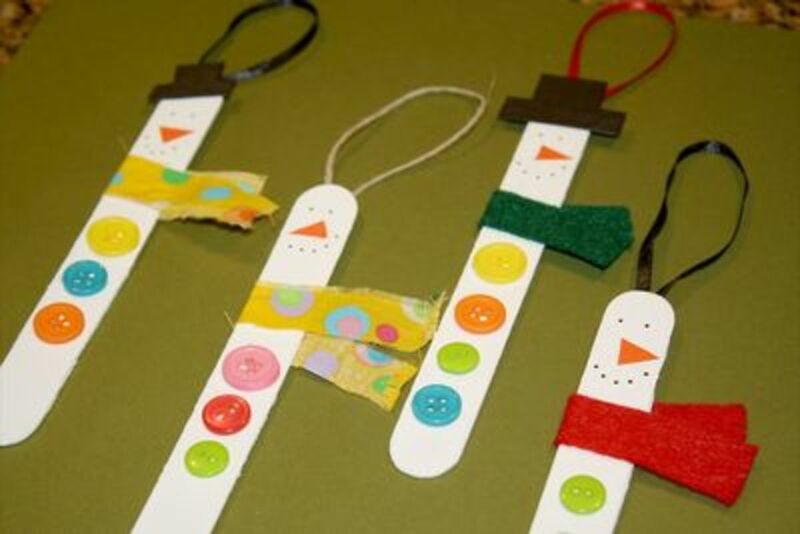 The kids will love helping make these sled ornaments to hang on your own tree or to give as ornament gifts. You'll find the tutorial at Fireflies + Mud Pies. Love the silver acorns crafts! It looks like something I can do. Great hub. You included such beautiful pictures and references for the crafts. It was meticulously put together. I enjoyed reading it. Merry Christmas! I love these ideas. Many of them will be great activities with my grandchildren. Thanks so much for the variety. 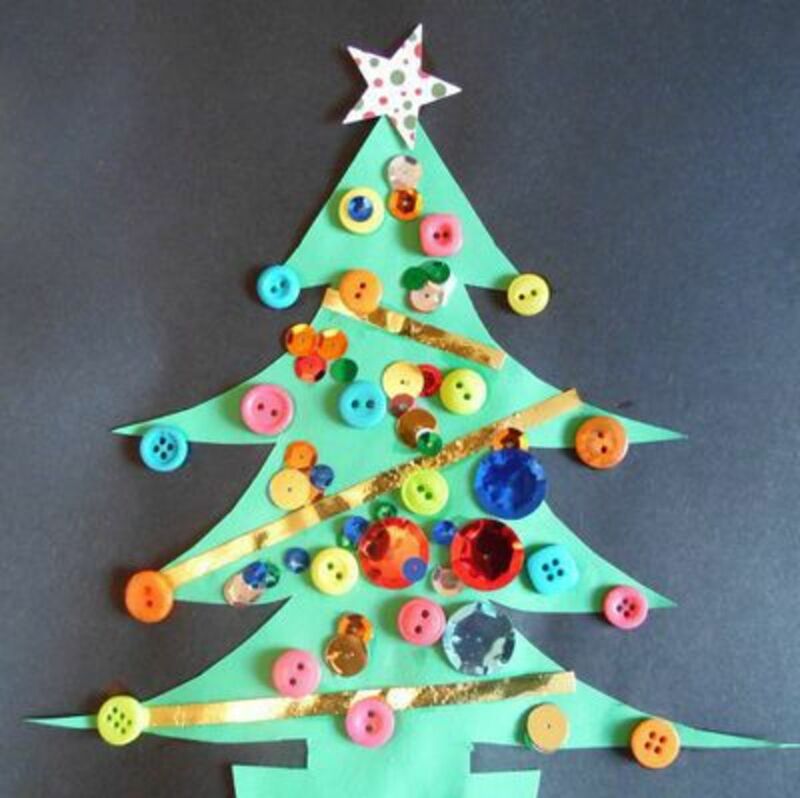 The Christmas tree decorated with buttons will be perfect for my 2 year old grandson. Super hub, and thank you. This is a great resource of things easy to make. I think I will make the felt Christmas trees to give away to the villages here in Cambodia to share a bit of Christmas spirit.